JOYO Tai Chi review, pics, demos.. Discussion in 'Effects, Pedals, Strings & Things' started by Turi, May 5, 2016. 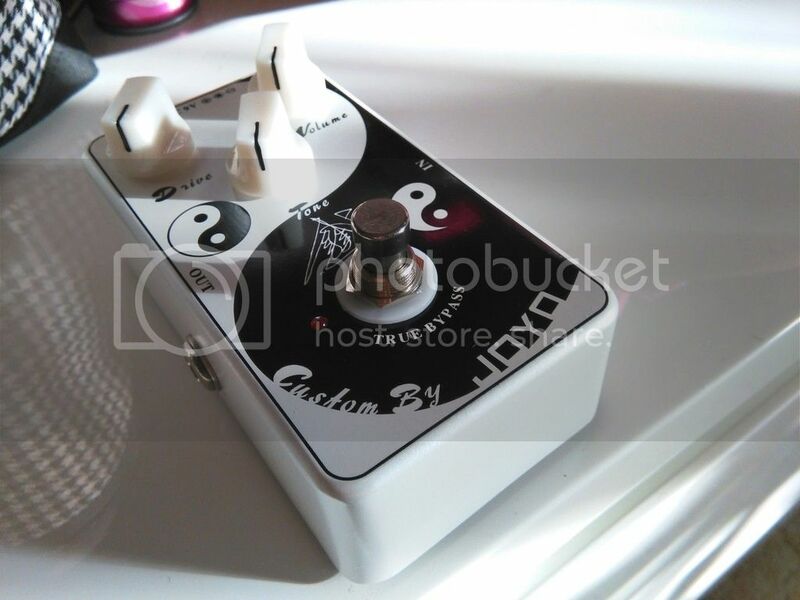 'sup fellas, I got a new pedal in today - a JOYO Tai Chi overdrive. I've got some pics here, some demos yada yada. It's discontinued, and was a signature pedal for JiBin, I don't know who that is. It doesn't sound like any other OD I've had or played before, it's voiced smooth and manages to get some sweet sustain happening, you can get it to be a bit more spiky and trebly and a little more brash however. The tone knob does loads, very big sweep, but it's unusual.. I think it matches the natural guitar tone at around about 7-8, which means you have a little room for going brighter, but a lot of room for going darker, which is great and what I think the pedal is all about - it's a great sounding darker overdrive. I've got a SSS Stratocaster, I'd imagine it'd get muddy with humbuckers but with my Strats single coils, man, I really dig it, a lot. It's packing quite a bit of extra volume.. not as ridiculous as the JOYO Ultimate Drive, but a great amount, and it sounds awesome when used as a boost. It's packing a fair amount of gain, but it's sorta weird how it works. With the DRIVE maxed out, but the TONE knob at 0 - it's a really smooth, inoffensive, darker sounding OD - as you raise the TONE knob, it gets louder and brighter, and once it goes over 8 it gets really bright and trebly.. sounds great, IMO. I don't understand why the TONE knob would increase the volume. So yeah, very nice to look at. Here's a couple of demos, nothing special just trying to show some sounds.. This first demo is over a backing track, and is all a Strat neck pickup - so when you hear it go trebly, or darker, etc.. I'm not changing the pickup selector. You can clearly hear it gets really trebly when I up the tone knob, and you can also hear it's a darker voiced smooth OD for the most part. The higher the tone knob, the more gritty and dirty it gets. The playing here isn't great, and it's restrained, because I was playing on the couch and my partner was kinda wincing the whole time I was playing.. eh.. anyway, check it out, I think it sounds great. It's mostly the same few little licks and what not, and altering the pedals knobs with my hand in between. Just trying to show some of the toanz you can get from it! Not trying to show anyone how I'm heaps sick! Setup is Strat > TAI CHI > S-Gear 2. This one here was recorded through a Zoom H1 set up not far from my Peavey Classic 30, a little pickup selector fiddling.. this one Strat > TAI CHI > Peavey Classic 30 on clean channel. The Peavey is on 1. For real. The H1 also picks up birds and **** outside but whatever, that's cool with me. Peavey reverb is on 0. Hope someone enjoys it, it's a killer pedal, cheap as ****, and even though it's voiced darker than most ODs - it is really easy to fit into a mix, which is great, imo. I think it sounds great pretty much every setting, I like how it sounds as a boost, I like how it sounds with the drive way too high and the volume lowered, I like how it sounds with the tone knob down which makes it smoother and more sustain-y, and I like how it sounds with the tone knob up which makes it more trebly and almost gives it a static-white-noise kinda sound. Really unique OD, to me, that might not come through in those recordings but it doesn't really sound like anything else I've played. I can't ****ing wait until Saturday night, I'm gonna jam it out at rehearsal, which I'll record, and upload something in here to try show it off in a trio/band format, and my playing will be less restricted (not necessarily any better). I think it'll sound amazing at higher volumes. scolfax, Pizza and Able Grip like this. Here's some band rehearsal clips with the band, both using the JOYO Tai Chi into the clean channel of a Peavey Classic 30. I've got a sore throat and completely ****ed the vocals but ignore that ****. This OD is legit. Lovin' it. I improvise all solos. Haven't learnt them yet. I'm stoked at how mad this thing sounds in the band and at higher volumes, only got the Peavey to 4 tonight but man, it sounded mad as. Recorded through a H1. Sounded better in the room, I promise. this is my favorite pedal!!! i've been meaning to buy a second one for a backup or set up for a different sound! Yeah it's great.. might have to jump on that ASAP because they're discontinued. No idea how many are left on eBay etc. I dig how it's smooth even with the drive and level up, if the tone knob is at about 7. Above there it gets brighter and grittier and sounds killer just in a different way. I also like how if you dig in on double stops etc it works with that too and gets more gritty/aggressive/dirty, just like it should. Great time to be into this stuff. Killer pedals like this for next to nothing. Crazy. yeah, i got mine in Dec. and they said it was discontinued. I've been watching the seller on amazon from whom i bought mine , and his stock number kept going down till they said 1 in stock with free shipping. I checked today now it's back to generic "in stock" with like $3 shipping. My guess is they've got more, or sales of it have picked up and they've started making them again. I've though about using my ABY pedal to send out two signals all the time into two separate signal chains using 2 of these pedals, and then using an AB box down the line to pick between the two loops. Since i use my ABY as my boost, it's going to be on the board already, so might as well make use of the A/B side of things. Is it a Zen Drive clone? Weird, I can't find anywhere that it's been revived.. I'd totally snag another one if I were you, and able to utilise them both. I'd dig how it sounds with the tone maxed, as a treble boost, basically. I'd use a second one like that, I think. Nah, it's an original design. Nice review! Those are some quality noodles. Does the Tai Chi feel sturdy? They're the right price at any rate. Nothin like hearing a player rip it UP with a "budget rig" to get rid of GAS. Budget rig is in quotations 'cause your gear is completely respectable but not a $10k rig. Nothin like hearing an incredible player absolutely rip it the F UP with a "budget rig" to get rid of GAS. Thanks for the kind words, lol. Yeah it feels sturdy. Not BOSS sturdy, but sturdy nonetheless. The more money someone spends on their rig, the more of a chance there is I would leave 'em in the dust 1v1. Nothing like hearing an incredible player absolutely rip it the F UP with a "budget rig" to get rid of gas. I like the artistic liberties you took in quoting me lol. scolfax, Turi, 782369 and 1 other person like this. Not many people catch it. I'm surprised. I got one for Christmas last year. It works well with my Monoprice 5w tube amp, pushing it into a nice overdrive easily. Little update - I've gigged the JOYO Tai Chi three times since having it, as well as multiple rehearsals (all with Teles, at the gigs), as my sole overdrive pedal, and it's sounded brilliant every time. So smooth. Doesn't get lost in the mix (well, you turn it up if it does, like any OD?).. the sound is just great.. best sounding OD I've owned.. I've had comments about my sound every time I've gigged, in one form or another, and they've always been positive. Very good overdrive, at a super cheap price. Just wanted to update saying it's holding up at gigs, no dodgy input jacks.. no sound cutting out.. no problems at all..
My JOYO tuner OTOH.. last gig.. went a little iffy.. it wouldn't pick up my low E string at the end of the night.. it's only done about 8-9 gigs and I only use it on breaks.. never use it at home.. so that's not a good sign.. if the Tai Chi messes up at some point in the near future, I'll have to ditch being cheap and buy solid products.. I bought one when they discontinued it. To my ears, it's a Zendrive flavor. Great buy for the price !!! I've read that they aren't based on the Zendrive.. anyone know for sure? If they are, I'll know where to look if this one fails. The Tai Chi isn't based on the ZenDrive, at least not very directly beyond them both being low-to-mid gain overdrives. 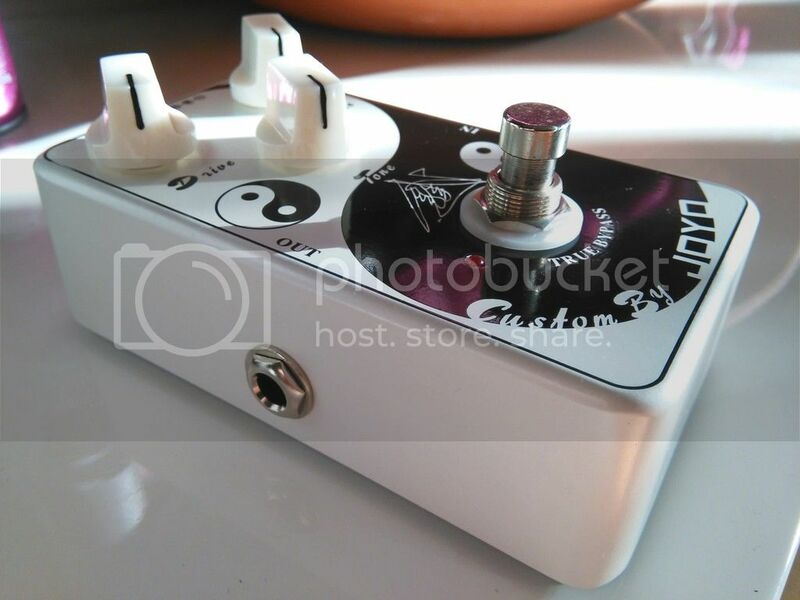 Of course, the main difference is that a ZenDrive (and its clones) has 4 knobs (Volume, Tone, Gain, Voice) while the Tai Chi has 3 (Volume, Tone, Gain). 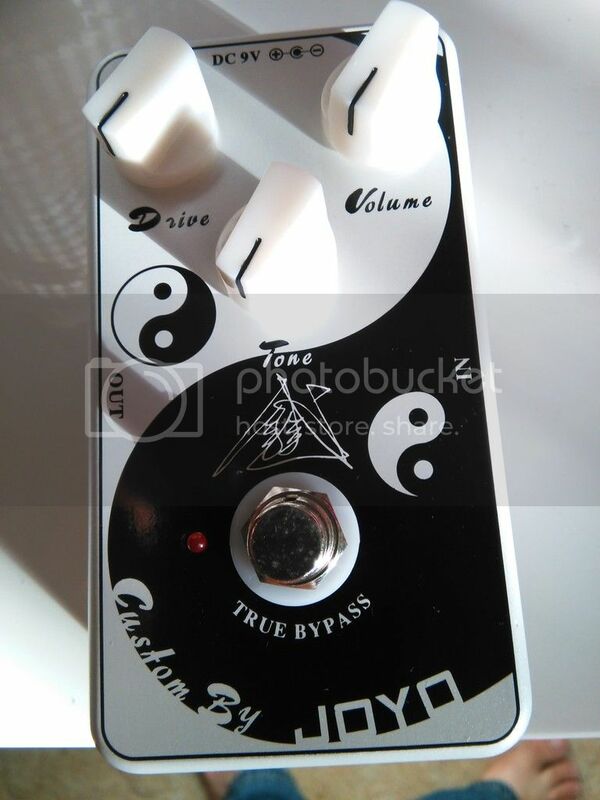 I've read that they aren't based on the Zendrive..
How are are you guys determining this isn't a zen clone? It could be a zendrive with a fixed voice control, thus only three knobs. Plus, it is Joyo, and Joyo and "original design" don't often go together. I've read everywhere that it isn't a ZenDrive clone. If it's a clone of anything I'd love to know incase it messes up one day so I know what to replace it with.